(Nanowerk News) Researchers from the UK, USA and India, led by scientists at the University of York, are embarking on a major four-year project which aims to develop new strains of rice to help to feed millions of people. The aim of the project is to develop varieties of rice that will be more resistant to extremes of climate to provide subsistence communities in India and elsewhere with more stable grain yields. Rice is the staple food for more than two billion people, but a quarter of global rice production -- and 45 per cent in India -- is in rain-fed environments. With climate change predicted to cause more droughts and flooding in the future, the challenge is to develop rice strains that are both drought and submersion tolerant. A team involving scientists in the Centre for Novel Agricultural Products (CNAP) and the York Environmental Sustainability Institute (YESI) will work with scientists at Cornell University in the USA and the Central Rice Research Institute in India. The researchers aim to gather valuable genetic information about variations in ancestral wild species of rice to identify beneficial segments of the genome that help plants survive drought and flood. 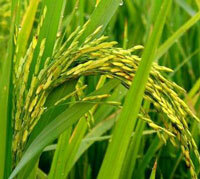 These segments from ancestral rice genomes will then be bred into commercial rice varieties. In parallel, researchers in India will conduct field trials using hundreds of lines of a commercial elite variety of rice carrying different segments of chromosome DNA from wild ancestors to gauge how these different lines grow under challenging conditions in the field. Using this field information, scientists in York and at Cornell will build up a detailed genetic picture of what causes increased resistance to drought in specific lines of rice. The York team will help to establish the genetic and molecular basis of the drought tolerance in rice and then use that information to breed into local varieties more rapidly. The work at York also involves socio-economic studies to identify and address the socio-economic barriers to adoption of new drought resistant varieties as well as modelling the impact of new varieties on production of rice in the context of climate change. The Director of CNAP, Professor Ian Graham, said: “This project builds on a discovery by Professor Susan McCouch at Cornell University that some wild ancestral species carry very beneficial genes even though they aren’t very good at producing grain. She has developed populations that have got segments of the wild ancestral species genome introduced into commercial varieties and these can now be used to discover drought tolerant lines. “The aim of this project is not so much to increase yields overall but to stabilise them under environmentally challenging conditions such as drought or floods. It’s using modern molecular methods to produce more robust crops that are not going to fail one year and perform well the next but perform more predictably under those environmentally challenging conditions. Professor Sue Hartley, the Director of YESI, added: “This project is particularly exciting because it combines the use of the latest molecular techniques for plant breeding with large-scale modelling of crop performance under different climatic conditions and a socio-economic assessment of the uptake of new crop varieties and their impact on farmer livelihoods. This sort of collaborative inter-disciplinary approach is what we need to address key challenges such as improving global food security. At the end of the four-year project, the international team hope to produce improved drought tolerant rice varieties that are accepted and adopted by local communities in rain-fed areas of India, as well as new breeding tools to enable rapid further development of new rice varieties.